I haven’t been able to contain my excitement since then. My texting history with Danny for the week is mostly all-caps and exclamation points, as I kept him regularly updated with sap hauls, syrup quality and recipe development through the days. 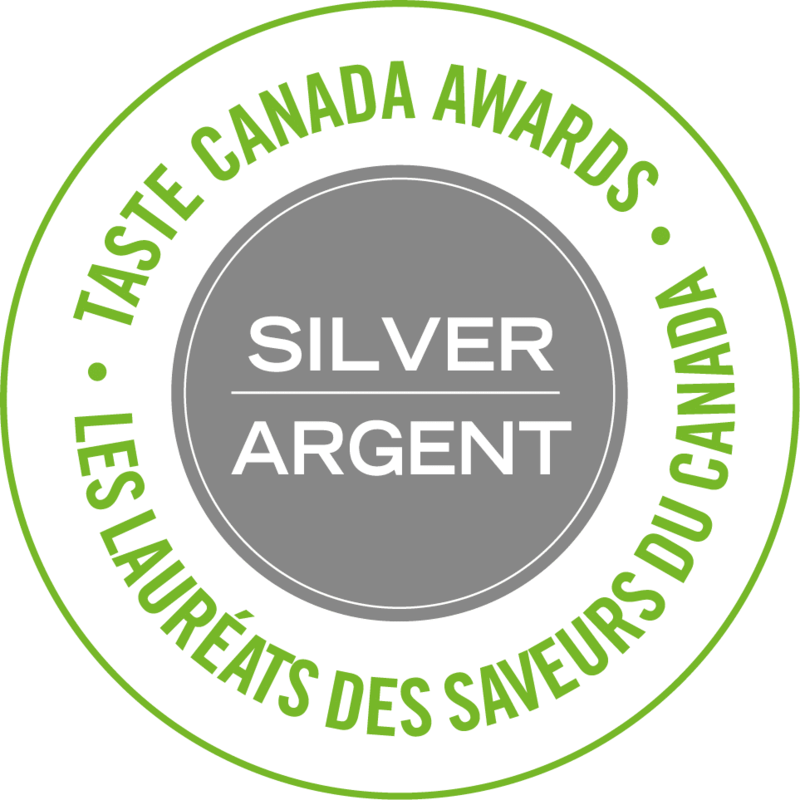 I’m sure my friends, Twitter and Instagram followers are sick of my maple-centric prattling, but I’m fiercely proud of what we’ve accomplished, regardless of how miniscule our operation is. It didn’t cost us a single penny and we’ve reaped two quarts of pure organic maple syrup, not to mention learned so much along the way. Our children were involved with the process from beginning to end, and we can chalk the sugaring off experience as one more way we are building our healthy family food culture. Danny’s already covered what we’ve learned about making maple syrup, but I’ll divulge a few of the goodies that I’ve been inspired to make and bake as a result of our surprise harvest. You know the first batch went to top pancakes. 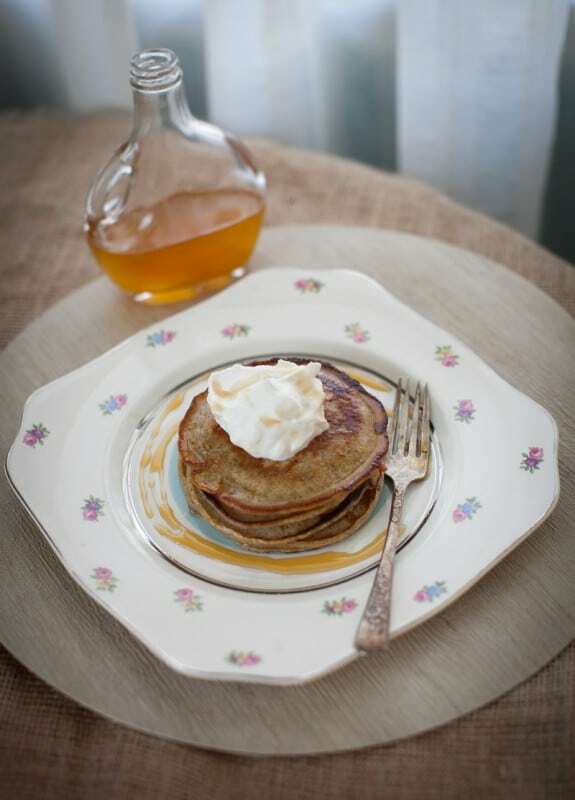 I had this homemade buckwheat pancake mix in the freezer, so all I had to do was whip a little cream by hand, drizzle in some maple syrup to sweeten it, and we had the perfect breakfast to showcase our homemade syrup. Waffles are up next. 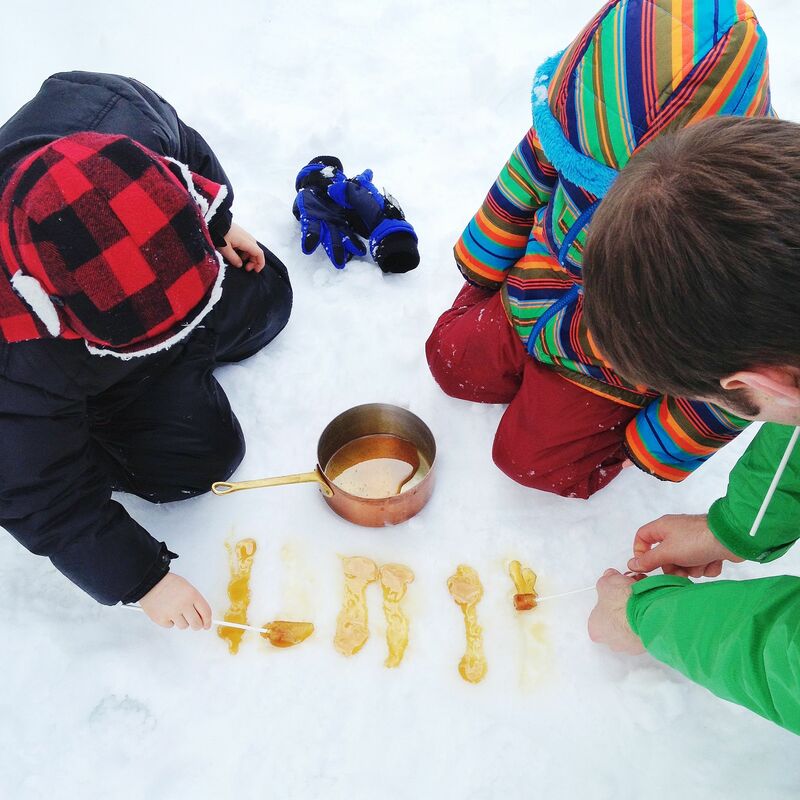 At the age of three, my boys developed an affection for maple taffy on the snow, or as it is called here in Quebec, tire d’érable. The process is simple: boil maple syrup until it reaches the soft ball stage (115 °C /238 °F). Pour in onto packed snow. Roll it up with a stick. Enjoy. And how! Maple + bacon is a combination well worth exploring. In this simplest form, the syrup caramelizes in the oven and gives the bacon a sweet and sticky coating that is second to none. 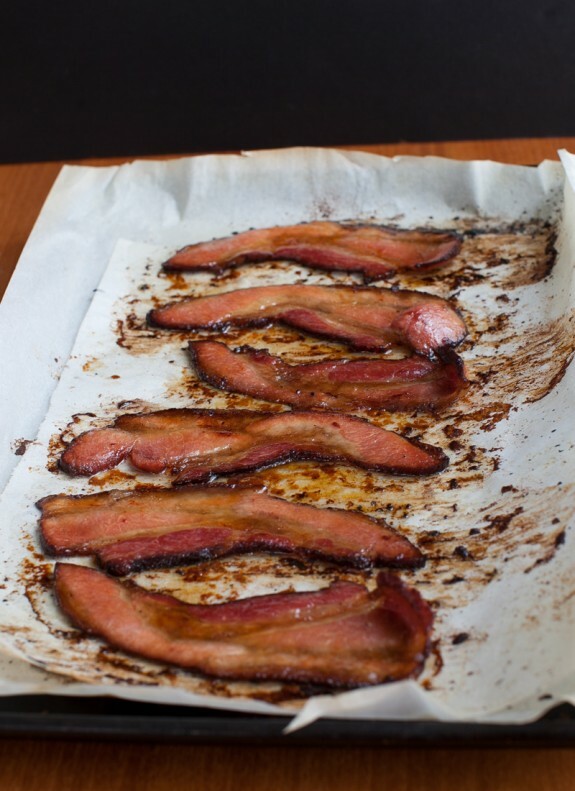 I bake my bacon on foil or parchment for easy clean up, and brush on the maple syrup in the last 5 minutes of baking. Any longer in the oven and you risk burning the bacon. What do you get when you take a basic recipe for marshmallows, replace the water in the ingredient list with fresh maple sap, and substitute pure maple syrup instead of corn syrup? The softest pillows of double maple marshmallow puffs, with plenty of all natural maple flavor. Just heavenly. We’re going to be toasting these goodies over a bonfire this weekend. 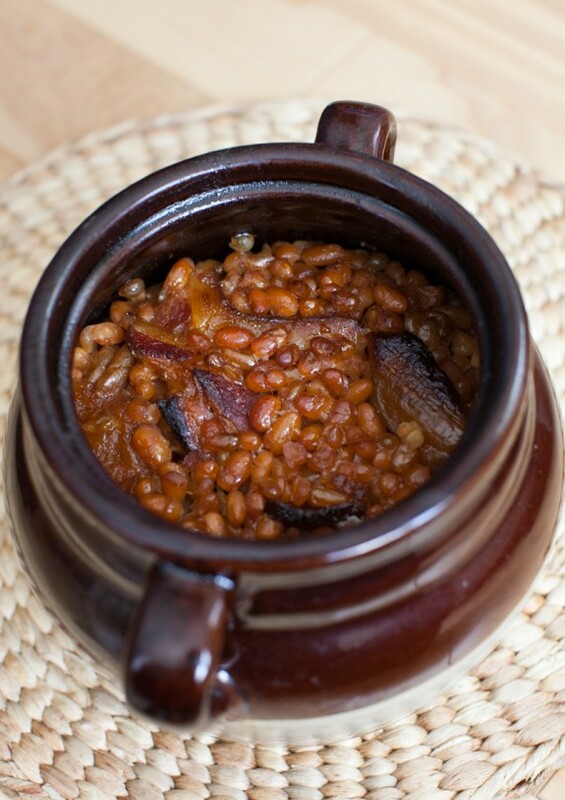 White navy beans, half an onion, a rasher of bacon, and a drizzle of maple syrup was all the effort that went into this bean pot. What really made them outstanding, however, was that I replaced the cooking water with freshly harvested maple sap. It’s slightly sweet, and of course, as it reduces in the bean pot, it sweetens the dish in the most natural of ways. I only wish you could smell how this little pot perfumed my home all afternoon long. The goodness does not stop here! In fact we’re heading into a long weekend, and I have more maple cooking and baking in the plans. I want to spoon fresh ricotta onto baguette slices and drizzle them with syrup. 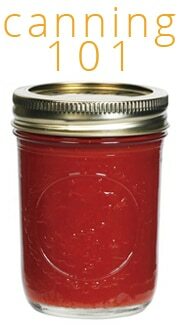 I’d like to test out a strawberry lemonade made with sap. And wouldn’t a maple glaze be perfect on Hot Cross Buns for Easter morning? Can you tell I’m inspired? Or perhaps just buzzed on maple syrup. I’m not telling. 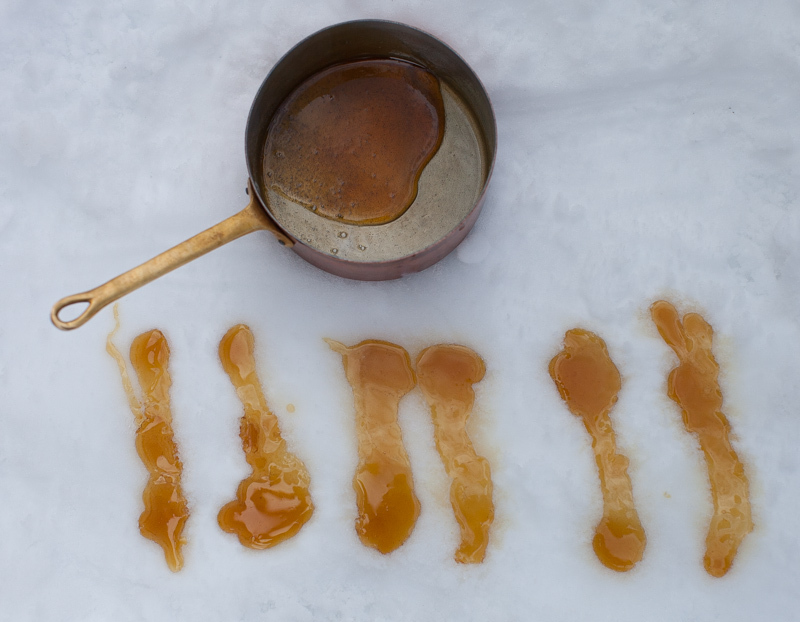 What is your favorite way to cook with maple syrup? 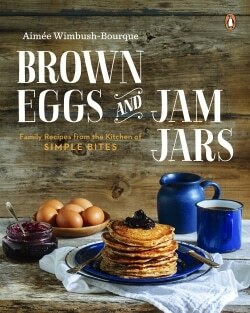 I am so jealous of all those yummy looking foods and the jars you have are so neat! Yum! 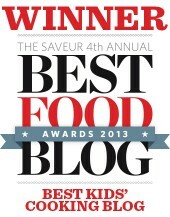 Love the marshmallow idea and grew up onSaturday night baked beans. The first time we tapped some old maples at our old Maine farmhouse, we got so much sap, we made beer with it. Seems like the first tapping of older established trees really gives loads of sap, as if the tree has been waiting all these years. Hard to say what is my one favorite recipe, I have so many, on oats, with slow braised pork and apples, on snow, it is becoming popular on lattes here in Vermont.Happy tapping and sugar sapping! All this week the temps have been above freezing during the day and below freezing at night, and now that I know what that means, I’m eyeing all the maples in the neighborhood in a new way. 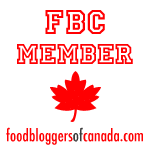 I think your maple sap and maple syrup ideas are truly inspired, and I’d love to have some of those beans . . . yum! 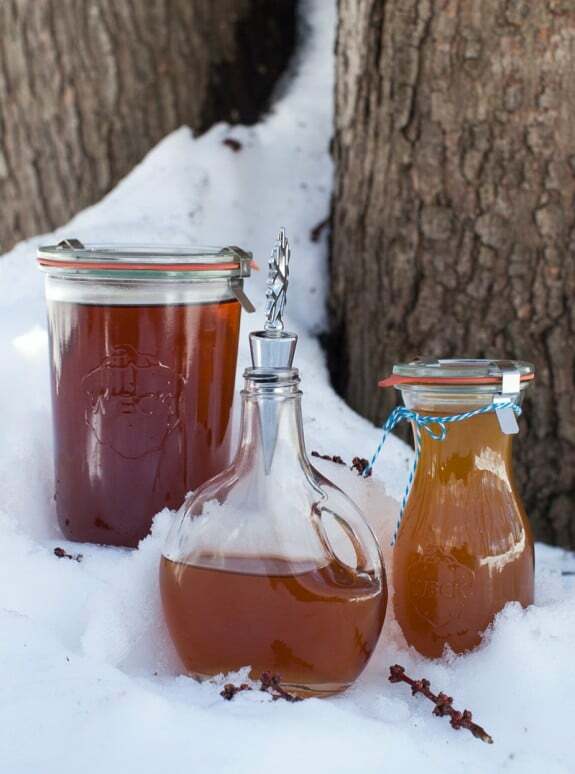 Are you saving the sap in some way other than making it into syrup? Things like the beans look amazing, but would be nice to have other than just in the spring. 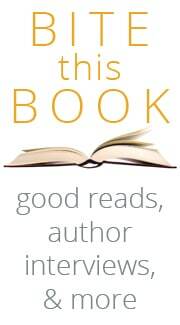 I’m so excited for you – what an amazing resource to have right in your own backyard! I’m honestly jealous of the maple taffy! So cool!! Oh WOW!! I want all of these maple recipes. Especially that bacon! I’m not tired of your maple centric prattling, but I think I might die of jealousy soon. Seriously. They make Maple Taffy in the snow in Little House on the Prairie!!!! I’ve been nurturing that little fantasy since I was ten. You all are killing me with your magical maple days. *sigh* It all just looks so awesome. Wish we had sugar maple capability here. Oh Aimee! I’ll take all of the above. Wonderful! All of your maple creations recently are so inspiring! I don’t cook with it nearly enough so my April resolution is to get it into my kitchen more often!! Love maple syrup! It is simply the best. 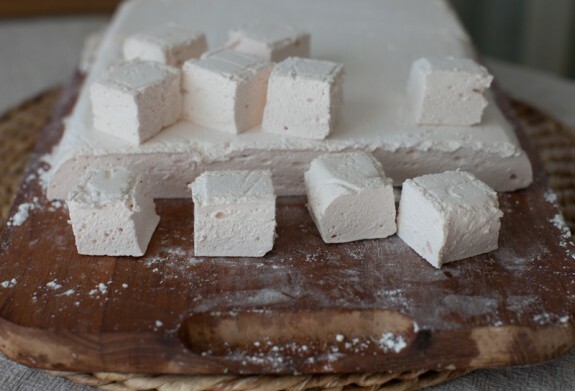 Homemade marshmallows are one of my favorites too, so I will for sure try making them with maple syrup. This is too cool!! Love it!! 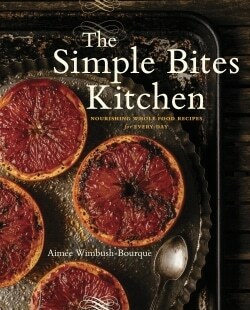 Everything looks SO good and I can just imagine the aromas in your kitchen!! I appreciated how you shared your reservations and then the success. What a fantastic experience for your boys ( and all of you!). When we moved to British Columbia I planted one lonely sugar maple in the front yard. It is too warm here but we enjoyed its gorgeous colour. Woah, where is that marshmallow recipe? We have a gallon of leftover sap in the fridge and it’s not enough to boil so I’ve been wondering how to use it!! Love all of these outdoors maple syrup photos Aimee! I love, love, love this post. Seriously Aimee. If I ever have the privilege of having a maple tree in my back yard you can bet we’ll be tapping into it. Love all your urban homestead inspiration! Oh yum! These are some awesome dishes 🙂 I’m so jealous that you have your own maple tree, what an awesome resource to have! OMG Love the Marshmallow idea. So fun! What a great idea. Loved seeing your pics of this on maple syrup excitement on social media, too. Have a great Easter! OH my goodness, how exciting! I’m inspired just reading your post and seeing the mouth-watering photos!! SO fantastic – all of it! I’m so envious of your syrup haul. No cost? No explanation on reducing the sap? I wished I lived in a fantasy world.